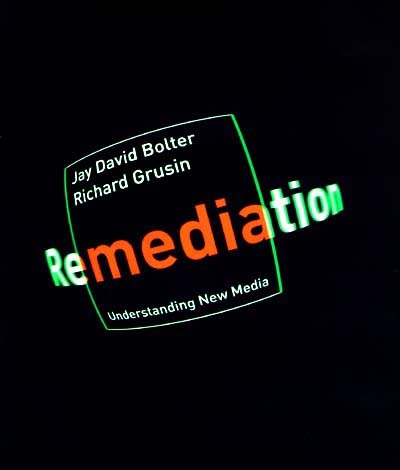 In chapters devoted to individual media or genres (such as computer games, digital photography, virtual reality, film, and television), Bolter and Grusin illustrate the process of remediation and its two principal styles or strategies: transparent immediacy and hypermediacy. Each of these strategies has a long and complicated history. A painting by the seventeenth-century artist Pieter Saenredam, a photograph by Edward Weston, and a computer system for virtual reality are all attempts to achieve transparent immediacy by ignoring or denying the presence of the medium. A medieval illuminated manuscript, an early twentieth-century photomontage, and today's buttoned and windowed multimedia applications are instances of hypermediacy— a fascination with the medium itself. Although these two strategies appear contradictory, they are in fact the two necessary halves of remediation.